Seems like a mix of urban and suburban, with all the surface parking around the retail. Reminds me of Mills Park. I didn't see the number of floors but with 300 residential units, it must have a vertical component. It says 6 stories right on it. HA! You can see my car parked in the overhead shot of the property. I really hope this gets built. The project consists of 350 units that are split between two, 5-story IIIA wood frame buildings and sit over a concrete retail and parking podium. As soon as I saw 5 story, I knew it'd be wood frame. No one cares about sound deadening. This isn't possible. The buildings facing the wrong direction and at the corner of Gore and Orange. If you zoom in real tight on the front corner of the building in the rendering, you can see that the brick pattern they used to fill in those parts of the 3D model, doesn't line up with the perspective lines of the building. I guess even sophisticated modern computer rendering software has it's limitations. Encouraging to see at least semi-urban growth south of Michigan. Orange Ave is so suburban and grungy south of Michigan -- hardly a worthy gateway into the CBD. One of three Zoe's Kitchens planning to open this year in Central Florida. 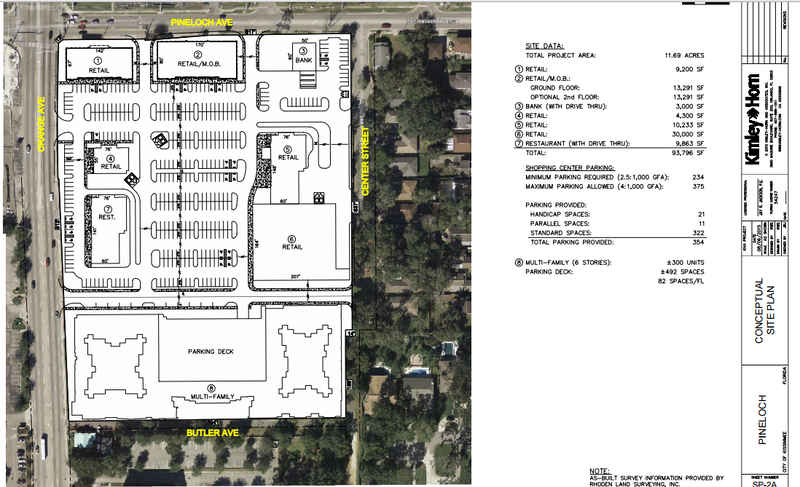 Corner of Lee and 17/92 in the K-Mart plaza is Winter Park is getting one as well. I can't recall where the third one is, I want to say Dr. P area. So I've been told that Thomas Lumber (on Gore) has sold their land for redevelopment. The north part of the property will be the first to be developed with residential units. I believe Mr. Jack Katz of Panama Jack has recently bought the Thomas Lumber site, he owns all those warehouse buildings to the north of that site. I've met him in person before and he did express an interest in redeveloping his property. I've always liked the brick warehouses around Franklin Lane and Ernestine. It would be cool if they would be (partially) repurposed. Oh that's right. I remember sunscreen was mentioned in the conversation as a hint. He has an office nearby but it is unmarked if I remember correctly. How unfortunate! I know there's an ACE down the street, but it's been so convenient to run in there (during the week) and avoid having to go to Home Depot! This is the only part of downtown that I visit at least semi-regularly (I get my hair cut down there once a month) and I can tell you that intersection of Orange/Pineloch looks great on the SW side. The SE will soon be nice. I mean, it will be hard to step up from a pawn shop with GUNS GUNS GUNS signs out front, but I think they can swing it. The NE corner is pretty locked in, but could use some updating. The NW corner, however, is awful. That trailer park behind the BK has some seriously sketchy people in it. If you've ever been to that WaWa, you've seen them trying to scam people at the pumps. Demo permits applied for 2203 S Orangeand 2501 S Orange to make way for new retail structures. The plans for a strip along Orange between Harding and Muriel (the Matress Firm plaza) are being re evaluated. I'm still sad about losing Lido's, but progress north from Chipotle is huge. It's actually more than likely that this parcel was bought up to be part of a larger land sale to the hospital. Got a promotional thingy in the mail yesterday announcing the opening of a new burger joint called Freddy's Frozen Custard & Steakburgers. Located at 3200 S. Orange, just south of Pineloch. ...if not a little on the pricey side. But then again, what isn't nowadays? I'll probably give it a try once just out of curiosity.